Welcome to LaborPosters.org! This is a one-stop resource for finding free, printable versions of all of the mandatory and optional labor law posters applicable in your state for 2019. Just choose your state from the list below, and visit the federal labor law posters page to print posters required for all businesses nationwide. 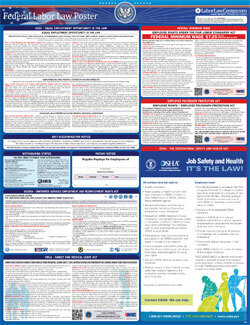 To comply with labor laws, most businesses with employees are required to visibly display a number of labor law posters from the federal and state Departments of Labor. These posters keep employees informed about the current minimum wage, occupational safety and health information, and other important labor laws and regulations. The Federal Department of Labor, and many states, require that essential posters be of a certain size and posted visibly in an area accessible to all employees. Failure to display all legally required labor law posters can result in fines and other punishments. Disclaimer: While we do our best to keep this list of labor law posters updated and complete for 2019 posting requirements, LaborPosters.org is provided on an as-is basis and we cannot be held liable for errors or omissions. If a poster on this site is missing or out-of-date, please let us know so we can fix it!